Last week I had lunch with the inspiring chicas behind Miriam's Kitchen social media communities. I've been following them for quite a while, especially on Twitter, and I love that they really tell a complete story line and engage with their community of advocates and volunteers. I told them I wanted to get more involved, but had this little problem about waking up and getting out of my house on time. Not going to let me get off the hook, they replied, "You'll be perfect for dinner shift then. Plus, you'll love Chef John... he's very farm to table!" Hook. Line. Sinker... and a few days later I was on my way to Miriam's Kitchen (located in the basement of the church at 24th & G) along with my friends Lisa & Alison. From the start it was very organized and we were put to work in the kitchen. 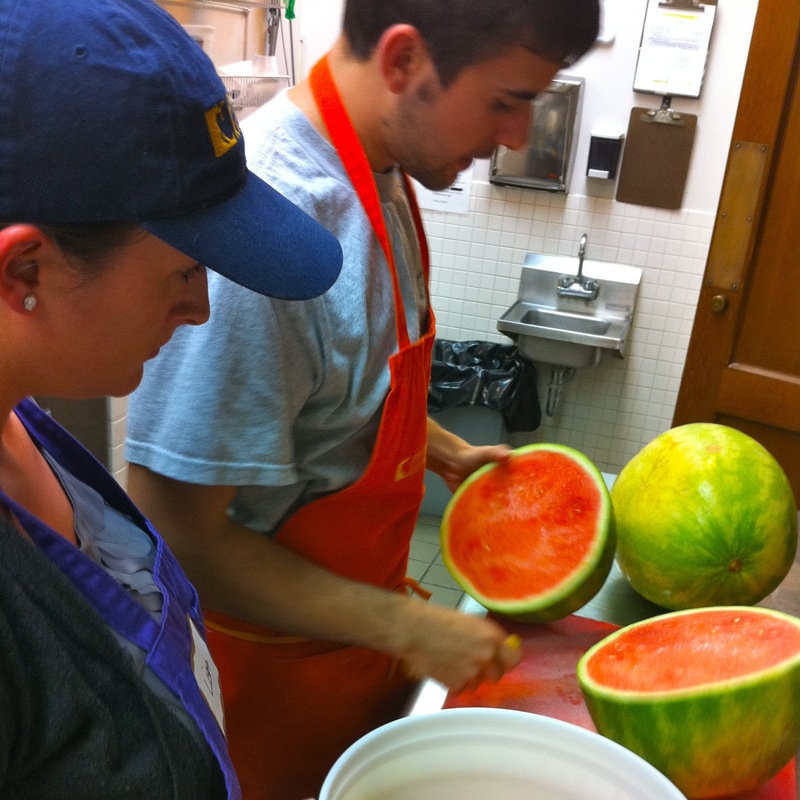 Lisa and I chopped two watermelons and two buckets of apples (precisely as Chef John demonstrated). Chef John Tip: Cut the ends off the watermelon first so you can set it flat on the board, then cut down middle, remove rind, cube. Next up, I cut sweet potato and chocolate chip bars into serving sizes. From there, we donned serving gloves and started manning our stations. Four of us volunteers were armed with serving spoons for the exact amounts to serve 190 people a creative, well balanced, healthy and delicious meal. I have to tell you, there were some nerves and a rush when that window went up and guests started heading our way. They filed through in groups of 10 as we asked them what they would like on their plates. I was impressed that all but about five tried the tofu *and* bison! I mean, I know these folks are going through tough times, but that's pretty adventurous. 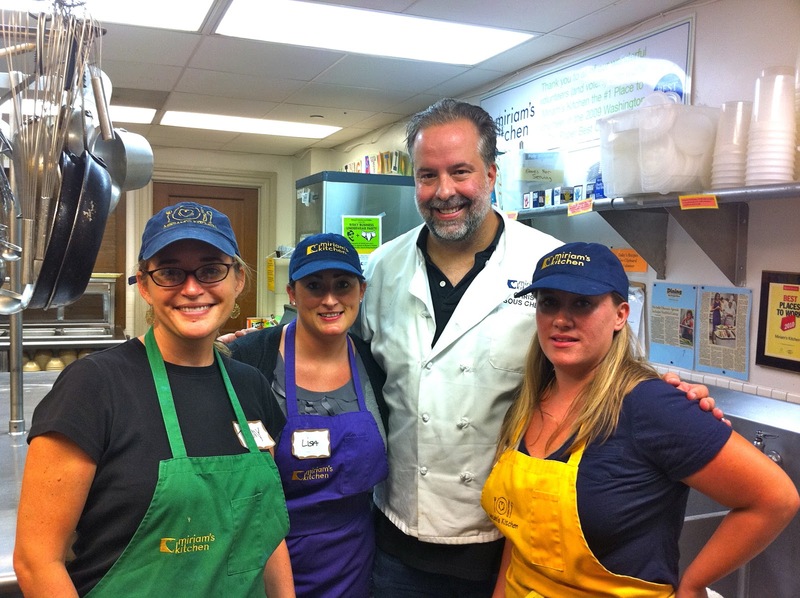 It was a whirlwind of smiles and compliments on our cooking. (And one request for corned beef hash for breakfast in the future.) After we finished, the volunteer team and chefs started breaking down service and cleaning. The kitchen was spotless and well organized. We chatted up Chef John a bit and found out he's a contender in the Sears Chef Challenge. Sears is looking for the next best chef in America AND trying to help food banks. I'd say Chef John is a two-fer. He's an amazing guy and a talented chef, so we hope everyone in the DC area and beyond will support him. Follow Miriam's Kitchen on Twitter, like em on Facebook and sign up for a shift to start helping today.